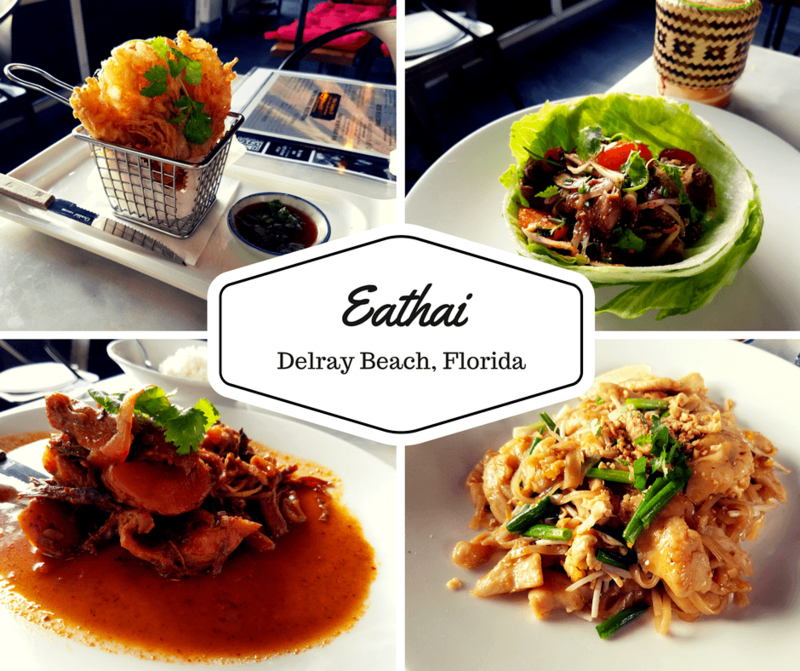 If you’re looking for where to eat Thai food in Delray Beach, then look no further than Eathai. They serve traditional Thai cuisine but with a modern flare! From the outside Eathai might not look like much, but it will surprise you. Located a few minutes from Delray Beach’s downtown area, Eathai is easy to find and has plenty of parking (unlike restaurants located on downtown’s main strip). Inside, the decor is cool and casual. We got there during Happy Hour so I treated myself to a glass of wine while I looked over their menu. The staff was really helpful in suggesting their favorite dishes and even helped with a special request. We asked if they had nam tok, a kind of meat salad. They didn’t have it on the menu, but our waiter was able to have it made for us! We also had fried enoki mushrooms stuffed with chicken and served with peanut chili sweet sauce, slow cooked chicken breast with massaman curry sauce and pan seared pineapples and red potatoes, and my all time favorite… chicken pad thai with rice noodles, egg, peanuts, scallions, bean sprouts, and tamarind sauce! If you’ve read some of my other posts, you’ll know I’ve been obsessed with pad thai since my trip to Thailand (I even took a Thai cooking class). I thought the pad thai at Eathai was great, as well as all of the other dishes. Apparently they make pretty good ice cream there as well, but we were way too stuffed to even consider any dessert. So if you’re exploring Delray Beach, Florida and get a craving for Thai food make sure to stop by Eathai. The ambiance is fun, the service is friendly, and the food is delicious! I LOVE Thai food! This place looks amazing… and it’s near the beach, you can’t beat that. That pad thai looks delish! I love Thai food, so I’m going to keep this in mind for the next time I visit South Florida. I have family in Weston and friends in Wellington and Lake Worth/West Palm Beach, so I do visit Delray every so often. It is such a cute town and full of restaurants. I had some tasty Latin food there on my last visit! I’ve only recently started exploring Delray, but like you said, it’s very cute with lots of food options! I can’t wait to try some more restaurants! I really like Thai food too, although I always feel like I don’t know what to order. It’s great to get some tips on food selections. All of the dishes look beautiful and tasty. Love it when they do the effort of making something off menu specially for you! And they made it look good too… Big thumbs up for it! I love Thai food! I haven’t been to Florida in years but it maybe worth a trip just to taste those delicious-looking dishes! Thai food is great…ummm. Never judge a book by its cover. The outside doesn’t look too impressive but when I see those dishes!!! Delicious. Oh that sounds so awesome Jackie!! I need a little more practice before I start throwing dinner parties though lol!! Amazing! Their dishes looks amazingly delicious! Seriously drooling here. Everything looks delicious! Haha! It was all so good!! I’m intrigued by the fried enoki mushrooms. I’m pretty sure I’ve never had that type of mushroom before. I love pad thai, too! I love, love, LOVE Thai food! I swear I could eat it every day. Looks like you had a great meal! Omg, me too!! I’m totally addicted!! My favorite restaurants (for the most part! ), comes from completely undiscovered little corners. It’s the absolute best! I know!! Always a good surprise! That’s something different and good from Florida’a side! I love Enoki mushrooms, I just had that when I went to a nearby Asian resto around where I was last week.